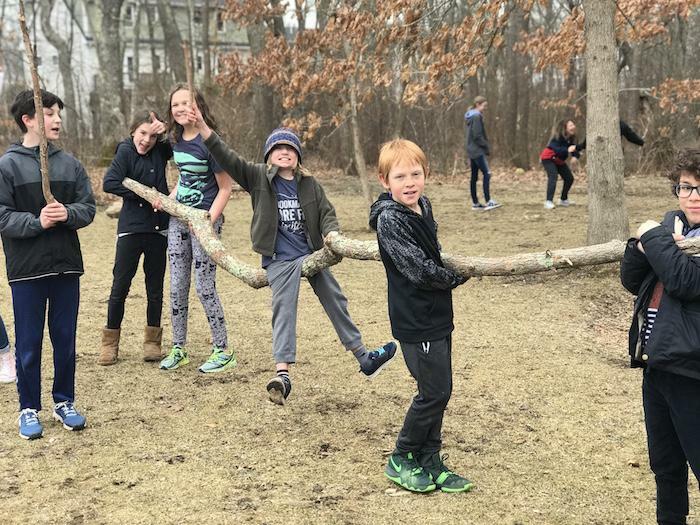 One of the most exciting, and anticipated, student experiences that has been with Quest from (almost) the beginning, is the New York City capstone study for our sixth year students in Upper Elementary. 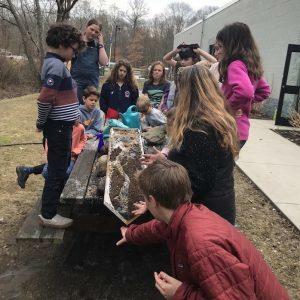 Over the course of the year, students learn about the inhabitants of the island of Manhattan from the Lenape Indians, through modern day. They examine how each “civilization” met their fundamental needs (food, shelter, defense, transportation, spirituality) and how humans use their heart, hands and minds to improve their environment and standards of living. Over several months, students research a specific site in New York City and its corresponding fundamental need and in the late Spring, the 6th year class travels to Manhattan to present their field of study and final papers on the grounds of the site they each chose. The 5-day trip is planned entirely by the 6th year students. 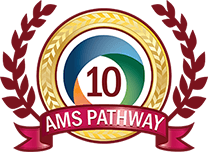 They are responsible for money management, daily transportation arrangements, and booking of educational activities for this milestone experience. The 6th years are in the process of finalizing their directions for the itinerary and restaurant reservations have all been made by the students responsible. 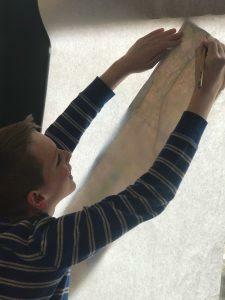 We have spent the last several weeks learning how to read the maps of Manhattan and deciphering the difference between streets vs. avenues, uptown vs. downtown, and express stops on the subway maps vs. local stops. All that’s left is memorizing their presentation cards and a few etiquette lessons. To say that the students are excited, would be an understatement. We have a daily countdown in class until we head off to the Big Apple! The 6th Years cannot wait to share their New York experiences with their families on May 9th at 6:00. The 6th years have been given the opportunity to visit the trade floor of the New York Stock Exchange. One of the 6th years chose to study the evolution of trade in New York City. In preparation for their visit, we had a guest speaker come in and give a lesson on how the stock market works, what is a stock versus a share, and tips when weighing the pros and cons when it comes to investing in a stock. 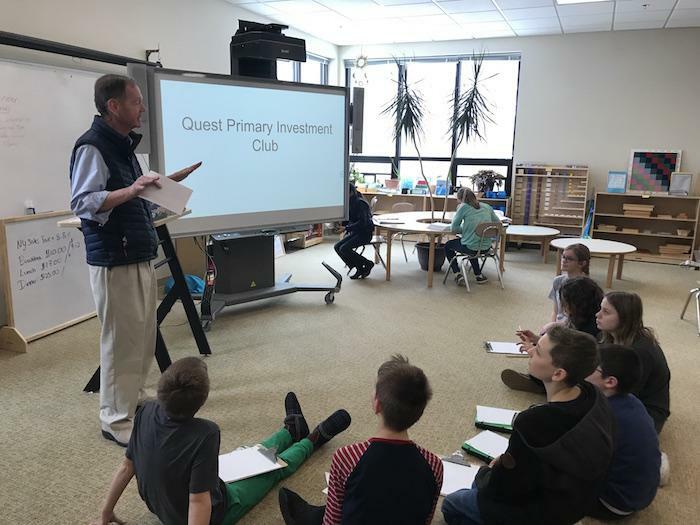 As a follow up activity, the Quest Primary Spring Investment Club was created. Each child was given a “budget” to invest in whichever stocks they wanted. They had to utilize their new knowledge of the stock market while choosing which stocks they wanted and how many shares they wanted in each. 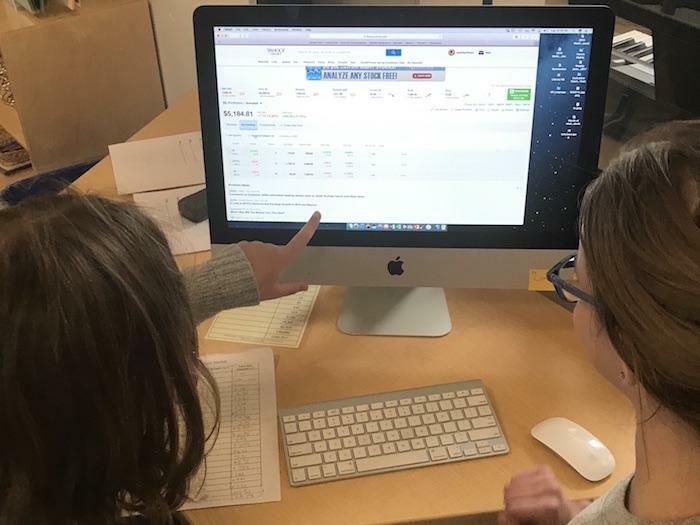 For the past month, the 6th years have been checking their stocks every morning recording their ‘day gain’ and ‘total gain’ numbers. They will eventually take these numbers and learn how to enter their data into an excel spreadsheet and graph the information. The 6th years are looking forward to finding their stock’s booth on the trading floor in a few weeks! 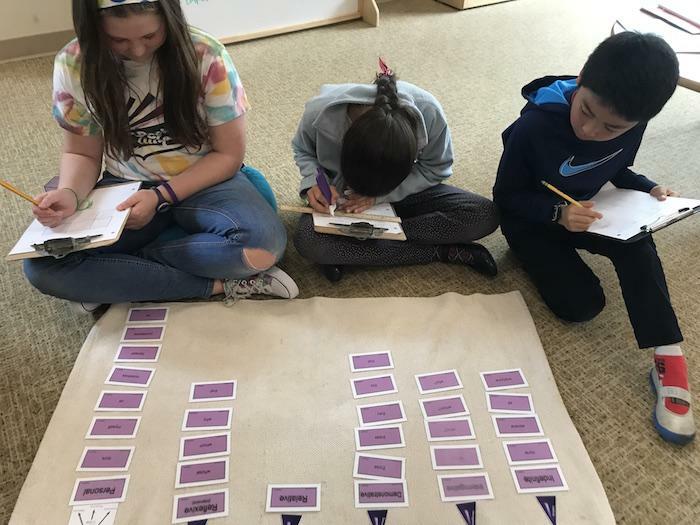 Similar to the New York research, the class is also currently engaged in a study of Ancient Egypt. 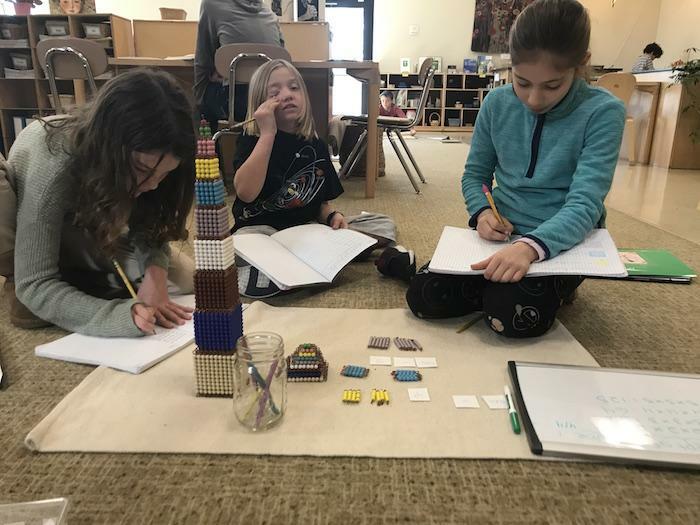 Each child in Upper Elementary has chosen their topic based on a fundamental need that the Ancient Egyptian Civilization needed to meet in order to survive. Eg. Shelter, food, clothing, entertainment, spirituality. From there, the children found their sources, took notes and are now in the process of cutting and compiling their notes to begin their first drafts. 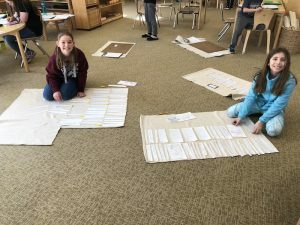 The class was broken into groups based on their topics and are currently collaborating on an exhibit that incorporates elements from each of their topics.  The class is energized and humming with creativity as they dive into the details of creating an unforgettable culminating event. In appreciation of their research regarding Ancient Egypt and the River Nile, Upper Elementary studied a river model to observe how rivers “carve, carry and deposit.” They also discussed how rivers have served as critical vehicles for agricultural development, trade and transportation. Taking advantage of the warmer weather, (not to mention the newly completed greenhouse), the students also planted pea and bean seeds to further their Botany study by exploring plant reproduction. Beyond New York and Egypt, the students have also been busy with all the other key subjects, including math and grammar work. It has also been nice to get a few sunny days outside…. we are ready for Spring to arrive in full.